So this was is it. This was my first pie crust success. Almost immediately after leaving my aunt I was anxious to make my own pastry crust. And sure enough the next day I was at the grocery store buying lard. I let one more day go by before I couldn't stop myself. It was a quiet Thursday morning. The sun was shining, the birds were singing, (okay that all might be a lie, I actually can't remember what the day was like, it was a while ago now :)) and I was in the kitchen prepping my ingredients. I followed my aunt's instructions to a “T” i.e. I didn't care or worry about a thing. I willy nillied, lolly gagged and nonchalanted everything. My only concern was that I needed to add a few extra tablespoons of water to gather the dough. But I let it slide off my back. I knew just by touch that this was my best pie crust dough so far. With the dough made, and for once looking and feeling like pie crust dough, it was time to focus on the filling. To be honest up until a few years ago I had never had peach pie. Somehow I had avoided it my entire life. 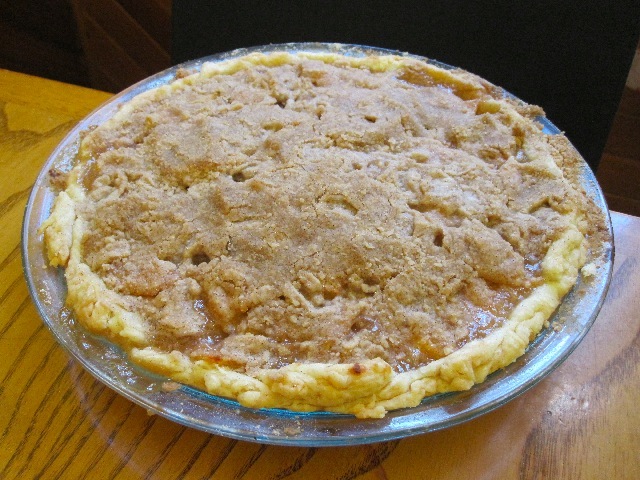 Week after week, year after year I would watch those crazy teens on 90210 consume bite after bite of delicious peach pie and yet I was never moved to try it myself. Although I can't say that my first taste was earth shattering, it was quite good and made me wish I had tried it earlier. 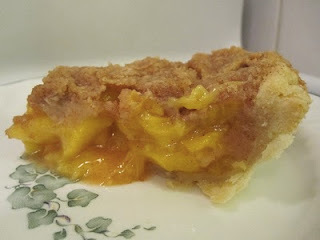 On this occasion, my reason for choosing a peach pie was simple, there were a lot of peaches sitting in the fridge going bad. I chose this specific recipe from the abundance of recipes on the internet (those 90210 kids sure got around) because of how little sugar is added to the filling. Now obviously if you are going to choose a recipe like this you are going to live and die by the quality of your fruit. But I wasn't too concerned. I would rather err on the side of not sweet than too sweet. Besides I was confident that the crumble would cover up any issues with the filling. Unfortunately (or perhaps not) because the recipe is quite basic and was already so light on sugar I really didn't have much to play with. Though I did manage to sneak in my favourite spice (psst...nutmeg). On a separate note I'm terrible at peeling fruit or anything that I can't use a vegetable peeler on (I suppose everything but vegetables?). It's like the Looney Tunes episode where entire trees are being milled to make a single toothpick (the episode in question is called: "Lumber Jerks"). I had forgotten how amazing the smell of a pie wafting throughout the house is. It calls to you. The scent of peaches baking with cinnamon, nutmeg and brown sugar is enough to make you tear up. But would the crust hold up (obviously at this point you know it did) or would it be another failure? I took a bite. For the first time ever I tasted victory. True it wasn't perfect, the filling had made the crust a little soggy which resulted in my always helpful brother suggesting that I "make it flakier." Next time I think I will blind bake the crust first. But despite this, the crust was flakier and tastier than any one I had made before it, and as a bonus, it was also edible. This was the dawn of a new day. The flavour of the filling was a tad disappointing but only because the peaches turned out to be a bit sour. Though as I had hope the brown sugar in the crumble was integral to balancing the flavour of the sour fruit. Unfortunately the crumble turned out to be a little sandy. Not really forming into a crumble. However, the next day things were a bit different. The crust firmed up after a night in the fridge and wasn't as soggy; the flavours were a little fuller and sweeter; and the crumble had become more crumbly. Like a fine wine (I hear) this pie got better with age. I couldn't be happier with how this one turned out. There is room for improvement but most importantly it was a delicious filling with a delicious crust. This is a wonderfully simple recipe with flavours that will definitely satisfy your peach pie craving. You might even say it's peachy keen. My favourite pie crust or your own :). Preheat oven to 450F and prepare a 9" pie plate with your crust. Set in fridge to chill. In a small bowl add butter, brown sugar, flour, cinnamon and salt and stir to combine. Set aside in fridge. In a large bowl add peaches, sugar, lemon juice, cornstarch, cinnamon and nutmeg and stir and toss until peaches have been thoroughly coated. Pour the filling (including all the juice) into the prepared pie plate. Evenly pour the crumble topping over the peaches. Bake pie for 10 minutes at 450F. Reduce temperature to 350F and bake for 30 to 40 minutes or until filling begins to bubble and crust is golden. Allow pie to completely cool before serving. The Peach Pit was my favorite part of 90210. I liked the show as a kid when the teens were actually in high school and before it branched out into Melrose Place and got very, very strange and soap. My mouth is watering...I need to try your lard crust...I need to do a lot of things! Have you ever tried preheating the cookie sheet and then placing the pie on it to bake? That seems to keep my frozen fruit pie's (shame on me) crust crispier. I smiled reading this post...Your aunt has it right, and so do you. @Gloria -- Nope haven't tried that. Buuut... I have had better success with other pies. Peaches seem to have a lot more water in them than say apples. But I'll keep that in mind. :) And yes you need to try the crust, but remember, the key is not caring :). @Velva -- Glad you enjoyed it, thanks for the comment! :) Hope you keep reading. Greetings from the Amish community of Lebanon Pennsylvainia.Richard from Amish Stories.